Pinned as Australia's biggest public transportation project, the 3-stage, $33.7 billion Sydney Metro covers 31 stations and over 66 km of new metro rail. Sydney Metro will total around $33.3 billion, across three stages, City & Southwest, Northwest, and West. Each stage of the New South Wales project is estimated to cost around $10 billion, with the Northwest stage set to cost $8.3b, the City & Southwest stage set to cost around $12.9b, and the Metro West stage, connecting the CBD to Parramatta, estimated to cost upwards of $12.5b. 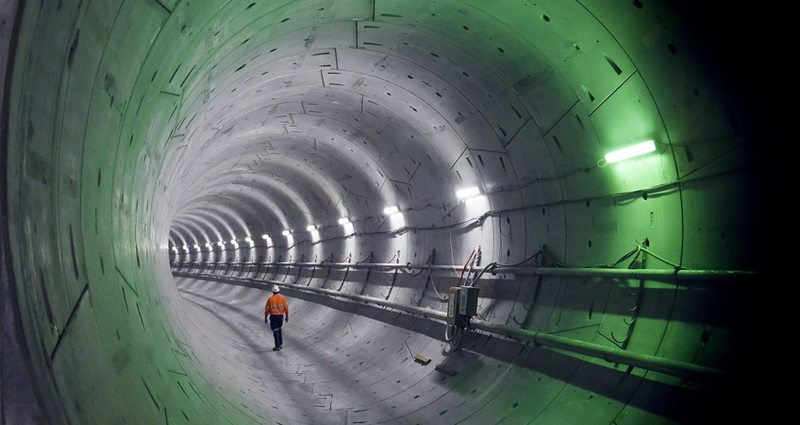 A key highlight of the project is a 1km tunnel stretch under the Sydney Harbour. The harbour tunnel is one of many that will see a total of 5 TBMs utilised across the mega project. Each TBM is around 150 metres long, with each being specifically optimised to cut through Sydney’s hard sandstone, where together, they are expected to excavate around 5.9 million tonnes of rock. The project has seen major contracts undertaken by CIMIC's CPB Contractors and UGL amongst others. Northwest is the first stage of the Sydney Metro, featuring 16 construction sites to deliver 8 new railway stations and 4000 commuter car parking spaces. Construction is nearly complete, with Northwest due to open in the second quarter of 2019. This stage includes 15.5-kilometre twin railway tunnels, a tunnel under the harbour, and new stations at Crows Nest, Victoria Cross, Barangaroo, Martin Place, Pitt Street and Waterloo along with new underground platforms at Central Station. Construction is currently underway on Stage 2, where it is expected to open to the public by 2024. The final stage of the major public transport project covers CBD to Parramatta and is estimated to cost over $12.5 billion. It will feature new state-of-the-art stations across the west, including at Westmead and Parramatta. The project hopes to augment and better connect existing far west services by facilitating better access, via transfers, to the outer west and Blue Mountains. Stage 3 is expected to begin construction by 2022 and open to the public in the second half of the 2020s.